A nourishing bowl of energy and blood sugar balancing ingredients. Quinoa is a whole-grain with impressive protein content, high in fibre, and phytochemicals that may help manage your blood sugar and blood pressure. Lets not forget the phytochemicals in beets, and the rich fibre and high-quality protein in legumes–which can help normalize blood sugar by slowing down how fast carbohydrates are digested and absorbed. To save on preparation time try to make your main ingredients of quinoa, beets, and beans a few days in advance. If your pressed for time you can use pre-cooked frozen beets and canned beans (opt for organic low-sodium). Whisk the olive oil, lemon juice, lemon zest, garlic, sea salt and pepper in bowl. 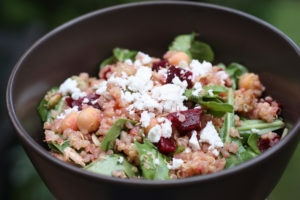 Combine the quinoa, beets, chickpeas or white beans, arugula, pumpkin seeds, sunflower seeds and toss with dressing. Place beets on baking sheet lined with parchment paper, drizzle with 1 Tbsp of avocado oil and season with sea salt. Roast beets for 30 minutes or until tender, poke with a fork to check. Remove and allow to cool before you peel and dice. Tip: The trick to making perfect quinoa is to make sure you rinse well before cooking. Quinoa is naturally covered in saponins, which give it a soapy flavour. Rinse the quinoa in a mesh strainer very well, rubbing with fingers. Drain completely. Place the drained quinoa in a pot along with water or broth. Bring to a boil and reduce heat to a simmer. Cover and let cook over very low heat for 15 minutes. Remove from heat and let sit for 5 minutes. Fluff with a fork. Quinoa can also be made in a rice cooker with the same ratios of water to quinoa. Rinse and drain chickpeas or beans. Place in a bowl and cover with plenty of cold water and baking soda and allow to soak for 12 hours or overnight. Once soaked drain and rinse. Transfer to a large pot and cover with twice the amount of cold water. Bring to a boil, cover and allow to simmer for one hour or until cooked. Drain and allow to cool. Once cooked they can be stored in the fridge, covered for up to 3 days.